Pre-blogging days, Julia Crouch was one of my favourite psychological thriller authors. 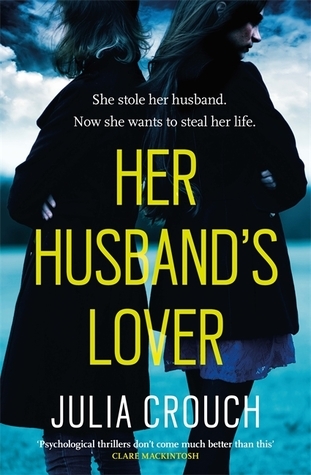 With Her Husband’s Lover, Julia cements herself as a favourite of mine in the genre. I was absolutely gripped by this story and couldn’t put it down. It’s so gritty! Just what I love in a psychological thriller. Louisa Williams has had a pretty horrendous past and she’s desperate for a fresh start. Louisa’s husband is dead. He died in a car crash. Sam was chasing Louisa and their two children when the crash occurred. Louisa always thought that Sam would never hurt her, but he betrayed her with a woman named Sophie. Sophie is determined to take what Louisa has left. She wants the life she should have had if Sam had lived. This really was an amazingly crafted psychological thriller. Julia Crouch has such a way of creating such terrible characters. I don’t mean badly written. I mean shockingly awful people that are easy to dislike. I love those sort of characters. I actually said out loud ‘Oooh, she’s a messed up woman!’ I had to remind myself that it wasn’t real! So sucked into the story. The two female characters Louisa and Sophie are incredibly well written. I can’t say that I liked any of them, but I loved to read from their points of view. Their interactions with each other were intense and their relationship was completely toxic as you might expect. I don’t often like a dual point of view that goes from past to present but Julia Crouch creates such a great narrative in this story. I couldn’t stop turning the pages. It’s a fairly long read but it doesn’t take long to get through it because there’s twists and turns all the time. I didn’t know who to trust. Some scenes made me incredibly uncomfortable. There’s plenty of shocking moments and nothing is first what it seems. The reason why Julia stands out in this heavily populated genre for me is her writing style. Julia Crouch doesn’t shy away from gritty, raw and quite disturbing stories. This is certainly all of those things and much more besides. If you love unreliable characters then this is the thriller for you! Great review! I’ve been dying to read this! It’s so good! I think you’ll love it! I really liked this one too. Great review! You’re welcome! 🙂 Thanks Chelley!